Hi, I am interested in your 1948 Willys Jeepster (stock #5106-CHA) listed on Autotrader for $24,995. I'd like to get more information about this vehicle and confirm its availability. A 1948 Willys Jeepster is already quite distinctive. So when attractive vintage looks meet a solid V8 upgrade and its all offered at an affordable price then you already know this is a sweet deal. Youre looking at a lot of firsts. After all, the Jeepster is the original SUV/crossover. While all Jeepsters are a rear sight, you get the distinction of a 1948 model its first year ever. So the history has appeal even before you check out the details. The chrome center waterfall grille with Willys-Overland emblem, intricate trim encircling the body, and proper Willys two-piece wheel trim all give this classic car distinction. Plus, those whitewalls have a great 40s style while also coordinating with the crisp folding roof and side curtain package. Its all set apart even further with a deep shade of burgundy that gives off a good gloss in the sunlight. Inside you get more vintage style with the classic two rows of bench seats and the vintage Willys dash. But you can also instantly tell this one has some cool upgrades. For example, youll love opening doors at car shows just to show off the custom white panels with the Willys-Overland logo stitched in a color-coordinating maroon. The horn makes the classic Aoogah! sound to attract even more attention. But the best pieces are reserved just for the driver. The Hurst shifter and VDO tachometer are an ideal pair, and the Chevy NK4 steering wheel is a hint at the upgrade under the hood. Theres no replacement for displacement, so youll love to lift the hood and see a Chevy small-block V8. This 283 cubic-inch unit is more than double the size of the original motor offered in the Jeepster. And this upgrade proudly shows off with the bold block and all the polished components. The motor exhales with a sweet tune as shorty headers feed a glasspack dual exhaust. The three-speed manual transmission means you have full control over this V8 upgrade and its soundtrack. Because youll want to cruise this classic all summer long, it even comes with power steering. 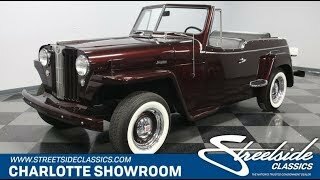 Distinction, upgrades, and affordability this Jeepster has it all. So its time to stand out for all the right reasons. Call now!